Last time, I wrote about how we as Christians, instead of being hypocritical, should try to imagine what it’s like for those who don’t know God. We should love on people. But society would have us head from one extreme to the other and tell people there is nothing wrong with sin. Today, many people are preaching acceptance and tolerance. The popular conclusion is that either you love everything about someone, or you hate/fear everything about someone. 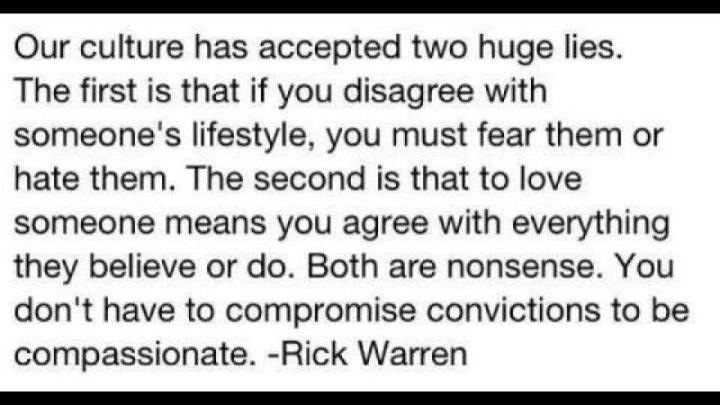 For many, it’s either tolerance or persecution. In fact, a popular consensus is that Jesus’ main message was peace and tolerance. People who say that obviously haven’t read the Gospels. Everywhere Jesus went, He healed the sick, cast out demons, and forgave sins. He never once told someone they were just fine the way they were. When He encountered sick people, He healed them. After He forgave sins, He told those people to “go and sin no more”. He told those who wanted to follow Him that they would have to deny themselves and take up their cross in order to do so. Wouldn’t it be ridiculous if a doctor said to his severely ill patient, “Oh no, you’re fine just the way you are. We’re not going to change you at all.”? That person would die without the necessary treatments and that doctor would be responsible. So how can we think that a Righteous and Holy God, who cannot tolerate sin to the degree that He sent His Son to die as an atoning sacrifice, would then teach people that sin is acceptable? Imagine giving your life in exchange for a cure for someone else’s disease and then telling them they are just fine and don’t need to take it. That’s ludicrous. And that is not Jesus’ message. People do not like to hear that they are doing something wrong. But if we love them, and have compassion on them, we have to tell them. Even if that causes division. Even if it gets us labeled as judgmental hypocrites. Let people call you that if they want. Just make sure it isn’t true. As I said last time, make sure you’re preaching God’s Word and not your own set of rules. You can show someone compassion without tolerating a sinful lifestyle that’s drawing them away from God. You can give someone grace and tell them to repent before it’s too late. You can give people selfless, patient love while still hating the sin that’s separating them from God. satan wants you to believe that it’s either one way or the other. Please don’t believe him. Instead, ask God to work in your heart and love others through you. Ask Him to fill you so full of His perfect love that it spills over onto everyone you meet, whether they like it or not. What do you think? Can you love someone without accepting their lifestyle? Or am I way off here? Please leave a comment and share your thoughts. Guest Blogs, Guest Blogs For Action, Observations, What Is Truth?